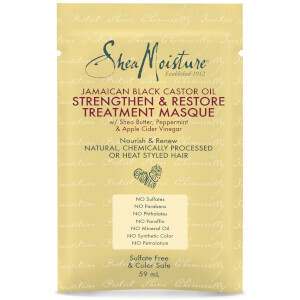 Treat dry, damaged and brittle hair to the Shea Moisture Jamaican Black Castor Oil Strengthen, Grow & Restore Treatment Masque; a deeply nourishing formula made with natural, certified organic and ethically sourced ingredients. 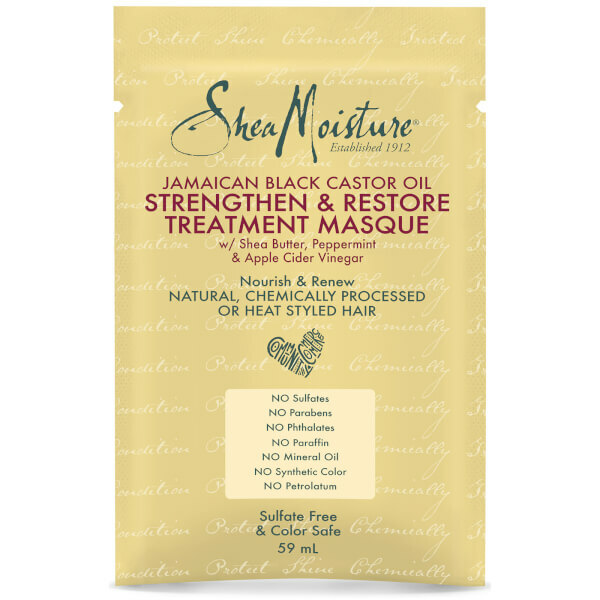 Harnessing the powers of Jamaican Black Castor Oil, the intense treatment promotes healthy hair growth, whilst Shea Butter conditions the hair and scalp to leave it comfortable. Ideal for colour-treated, chemically-processed or heat-styled hair, Keratin restores strength and combats breakage so you can experience smooth, sleek locks with improved elasticity. A dose of invigorating Peppermint stimulates the scalp. Hair is renewed, restored and repaired. After shampooing, apply a generous amount of the strengthening masque from root to ends. Pay particular attention to hair ends. Comb through for even distribution. Place a plastic cap over hair and sit under a warm dryer for 10-15 minutes. May be left on hair for up to an hour without heat. Rinse thoroughly. Style as usual. Water, Cetearyl Alcohol, Cocos Nucifera (Coconut) Oil, Glycerin (Vegetable), Butyrospermum Parkii Shea) Butter*, Stearyl Alcohol, Cetyl Alcohol, Behentrimonium Methosulfate, Fragrance (Essential Oil Blend), Behentrimonium Chloride, Panthenol, Hydrolyzed Vegetable Protein PG-Propyl Silanetriol, Cetrimonium Chloride, Persea Gratissima (Avocado) Oil, Mangifera lndica (Mango) Seed Butter, Olea Europaea (Olive) Fruit Oil, Mentha Piperita (Peppermint) Leaf Extract, Ricinus Communis (Castor) Seed Oil, Mauritia Flexuosa Fruit Oil, Yeast Extract, Hydrolyzed Keratin, Macadamia Ternifolia Seed Oil, Tocopherol, Hydrogenated Vegetable Oil, Niacin, Aloe Barbadensis Leaf Juice, Vinegar, Caprylhydroxamic Acid, Caprylyl Glycol, Trifolium Pratense (Clover) Flower Extract, Caramel.